Hi there! Hope everyone had a wonderful holiday with their family. We had fun, especially with a two year old, a BIG dog, and an old cat. Charlotte (my daughter's niece) turned two on Christmas day. Lauren and Paul have a puppy (and I use that term loosely), Percy, who is an Airedale and already 40 pounds! Kitty is scared to death of him, although Percy just seems to want to play! Kirby always asks for a special New Year's card for his wife, Gail. Their first date was on New Year's Eve a long time ago (Ha!). These little angels are so cute, aren't they? You can download this sweet image HERE. Just right click and download. What will you do for New Year's Eve? Have a party? Go to an event? Sleep? 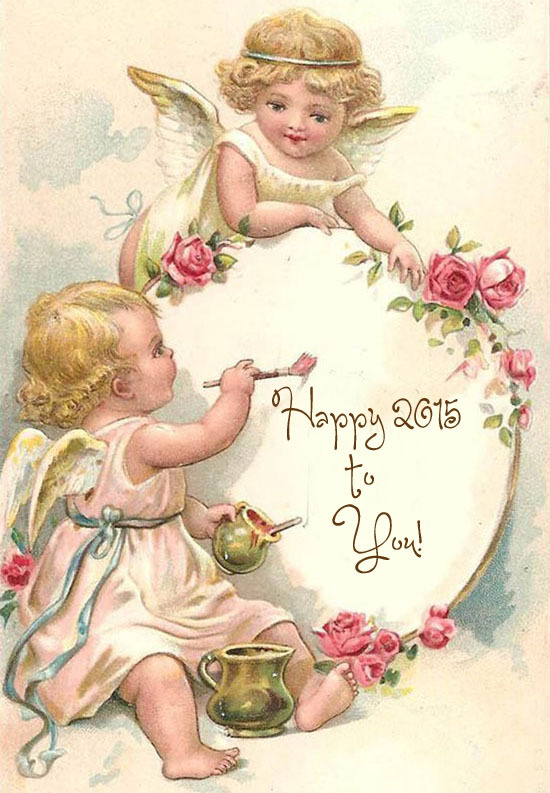 Whatever it is, I'm wishing you all the best for 2015! Are you ready? I think I've got everything planned. I made gingerbread and sugar cookie doughs today and they are chilling in the fridge. I'm getting ready to make a marinara sauce for the lasagne roll ups we're having Christmas Eve. Can't wait for everyone to get here! 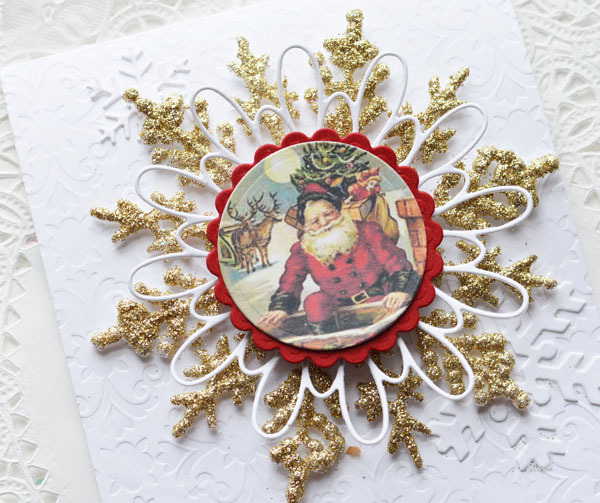 I've got a couple more of the Red, White and Gold Christmas Card Collection to share today. 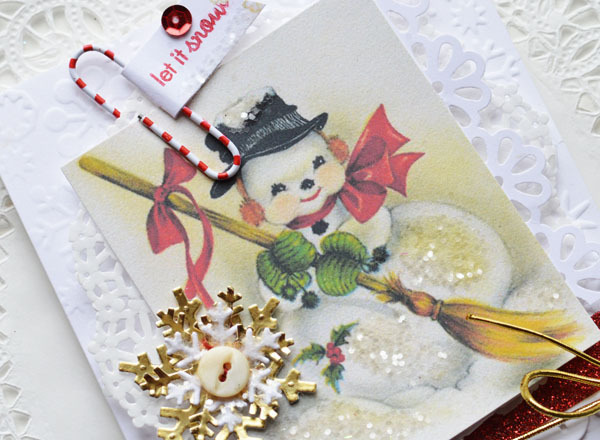 You can download the vintage snowman HERE. And the Santa (full image) HERE. I cut out just a portion of the image for the center of my snowflake. Just right click and download. So glad you stopped by! Here's wishing you and yours all the best at Christmas! What do you do on Christmas Eve? We used to always do a huge fancy dinner. 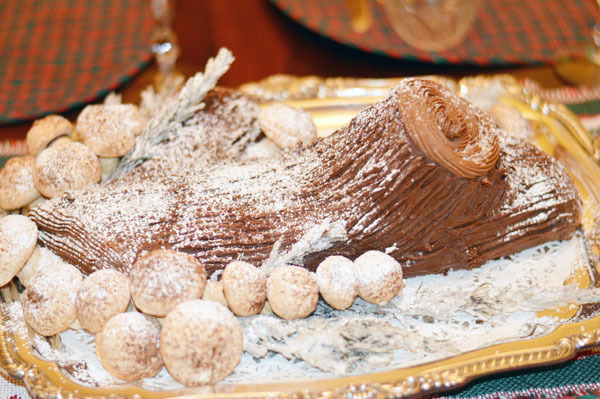 Then we switched to doing a Christmas breakfast. Do you open presents, do you play games? I'd love to know - I'm looking for new ideas! 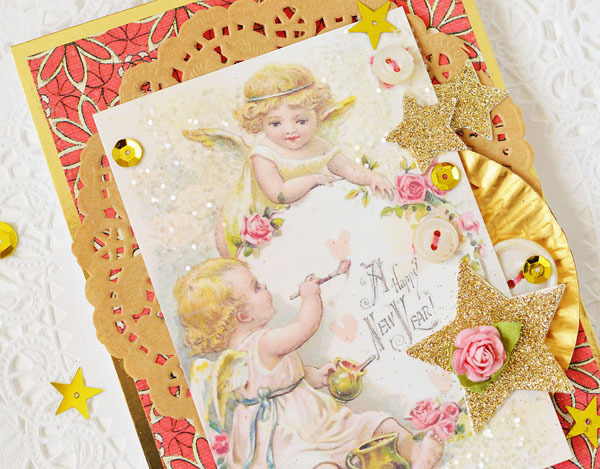 You may have already guessed that this card is another one from the Red, White and Gold collection. I really love the sweet red angel. She looks happy to me! If you would like a copy of her, you can download her HERE. Right click and download. What a wonderful week! Crafters are an awesome group of people, don't you think? From the generous shops, to the inspiring projects presented by all the lovely ladies, to all of you that took your time to leave some of the best comments ever! 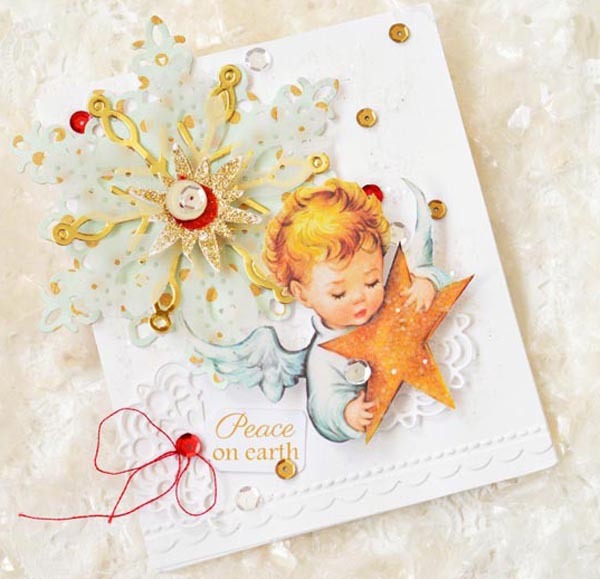 For the day after Visions of Sugarplums, I'm sharing another card that is part of the Red, White and Gold set. 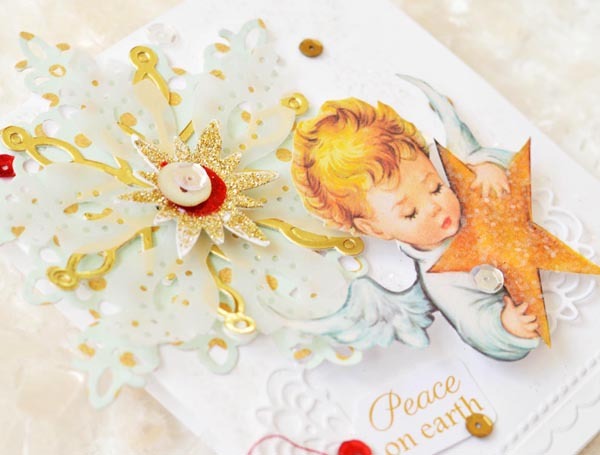 This sweet little angel is from Free Pretty Things for You. You can download it for free right HERE. If you've won a Vision of Sugarplums giveaway, please email me at lhairston@cox.net. I'll get back with you and let you know how to claim your prize. Check back on previous days - some prizes haven't been collected yet. Thank you! It's the last day of Visions of Sugarplums! 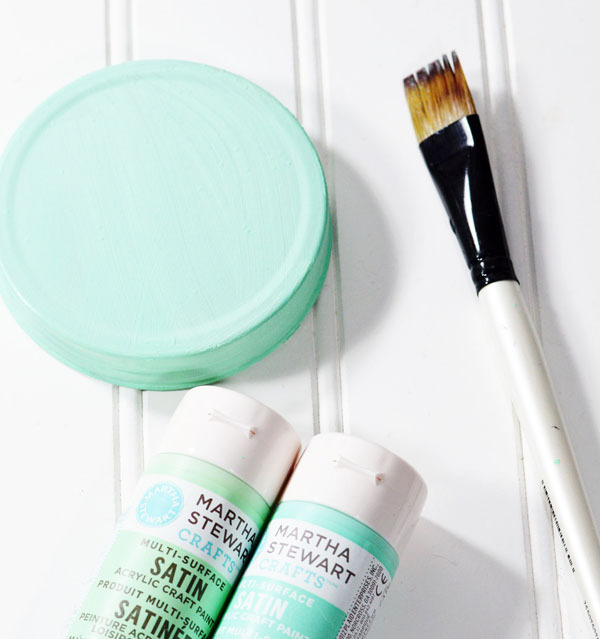 So many wonderful projects from the bloggers and awesome giveaways from the stores. A big 'ole HUG to them all! Bete's Iralamiji Shop has always been a favorite. Such beautiful goodies to be found! She's got Christmas tags all ready to go. 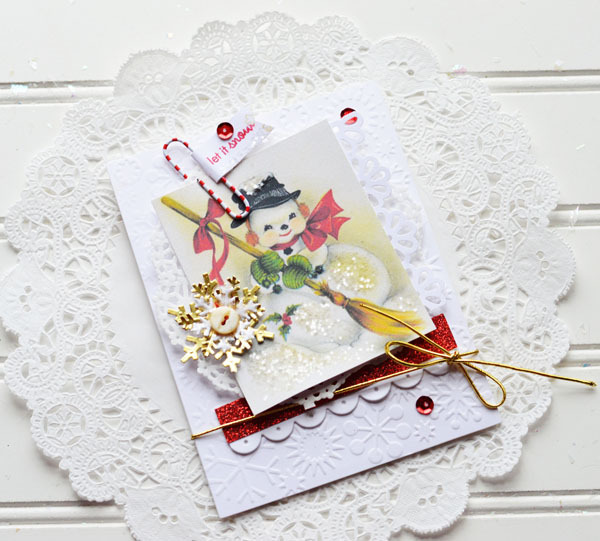 The one I used on this package is from the White Christmas collection. 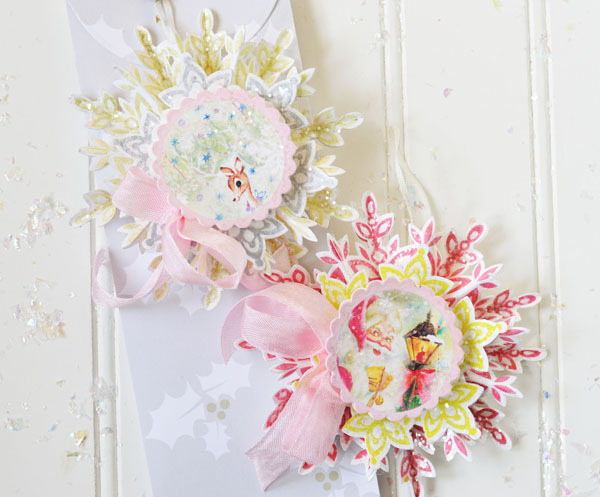 If you need cute tags for Christmas - look no further! I am really in love with how this bow turned out. And it is so easy! 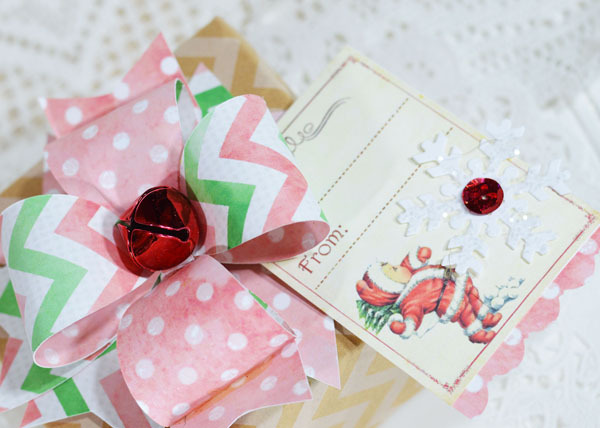 You can use a bow die or electronic file (like this one from The Cutting Cafe - also comes in PDF). You just need extra tails - a total of 8. Put 4 tails on the bows just like you normally would if they weren't stacked. Then fill in the corners with the other 4 tails. 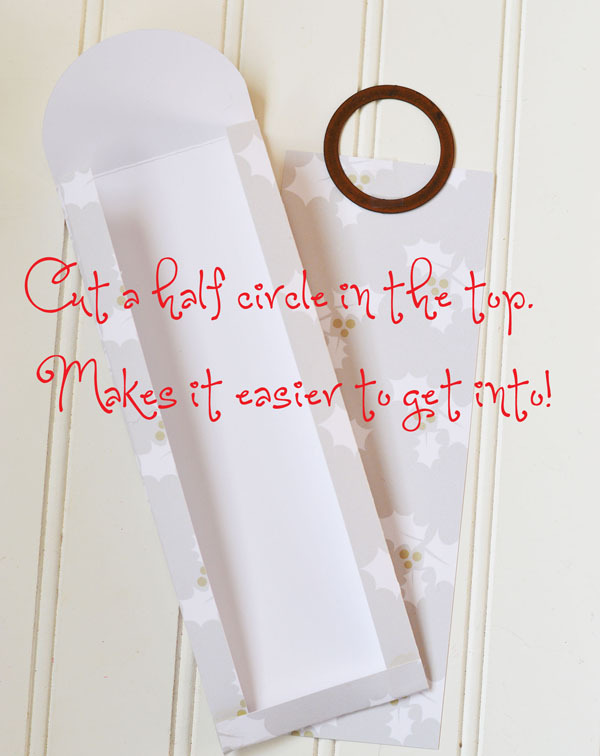 If you don't want to use a bell in the middle, you can simply cut a piece of paper about 3/4" wide and roll it into a circle. Need another stocking stuffer or easy gift? 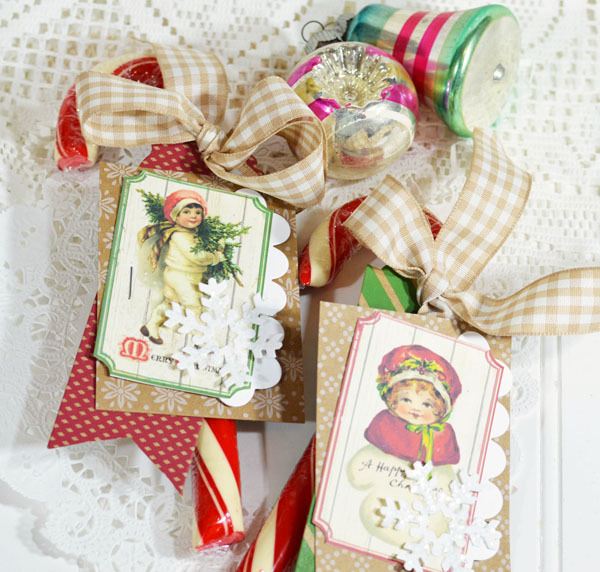 Make some quick tags and tie them to some awesomely huge candy canes. I was surprised to come across these at Walgreens. Once again, you can find darling tickets to make it easy and very pretty from Iralamija Shop. These tickets are from Bright Christmas Tickets. 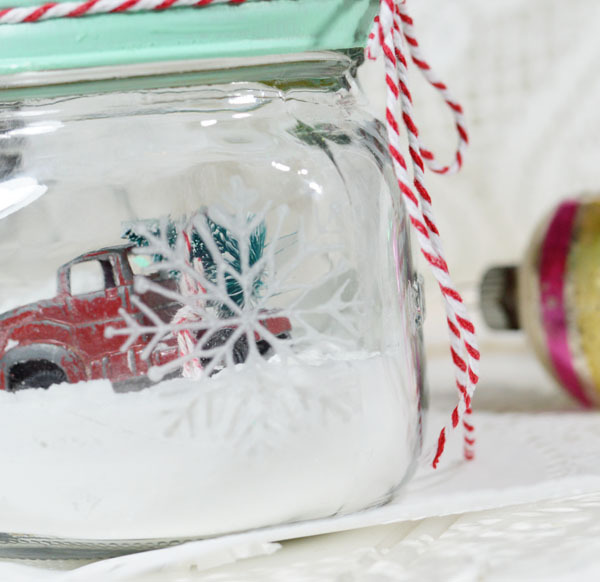 Okay, yes, there are a lot of snow globes out there and a lot of them have the iconic auto with a tree. But I don't care how many there are - I want one,too! Today on my way home, I saw a real car with a real tree tied to the top. Cool, right? My snow is a combination of Baking Soda, Baking Powder and course glitter. It's really pretty snow, actually. First I didn't want the mustard colored lid to this jar, so I painted it. I think it took 3 coats. This is my first time to use glass paint. The snowflake is so pretty! It's a good idea to tape the stencil to the glass. 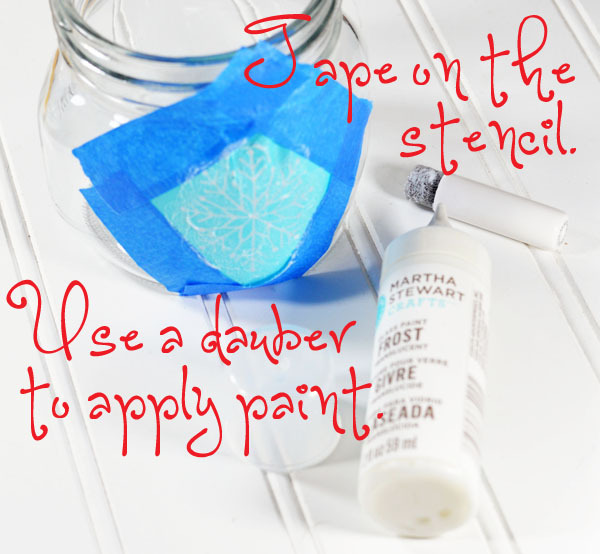 Not only does it help hold it in place, it also provides some space outside the stencil for the paint to land without it getting on the glass iteself. For me, a paint dauber worked better than a brush. Then I topped it with a snowflake. Confession: I have knocked over the little truck a couple of times, but at least it was easy to take off the lid and fix it! In your comment, please let me know that you would like to win. Comment here and then comment on all the participating blogs listed below. Your name will go in a hat (or basket or bowl) for your comment here. You will also get your name put in additional times for each comment left on the other blogs. When the prizes for one day are won, those names are taken out, but all the other names stay in the hat. Be sure to check back daily to see if you have won! The stencils include the one I used on my snow globe. They are so pretty! Check back tomorrow to see who has won the Mega Giveaway and be sure to check back on each day to see if you missed your name for a giveaway. It's now the end of Visions of Sugarplums - Wishing you all a Happy Christmas! What a week! 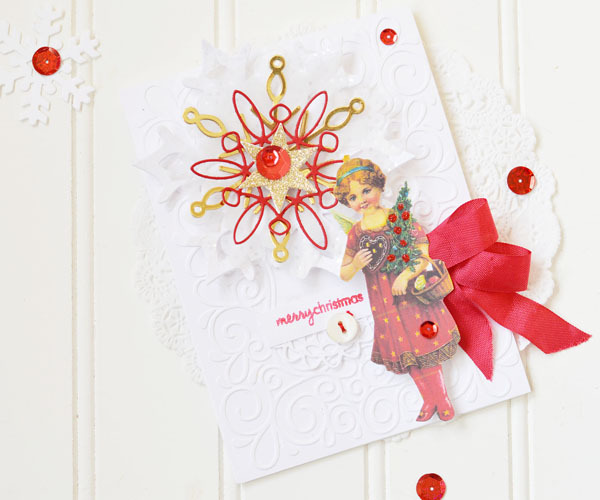 Hope you're enjoying the fun projects at all the blogs - I certainly am! 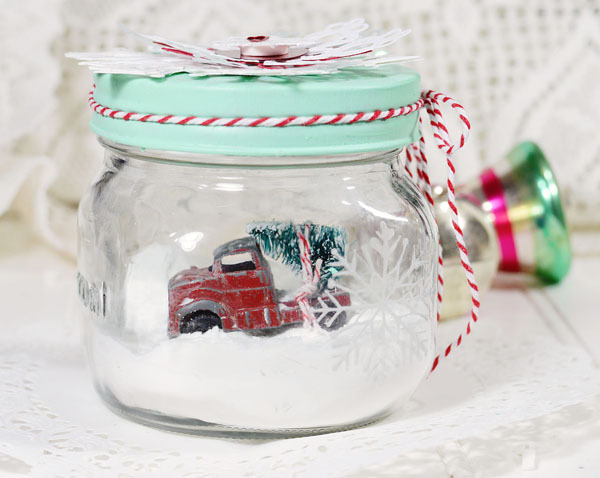 I just love all the creative Christmas projects I'm seeing! 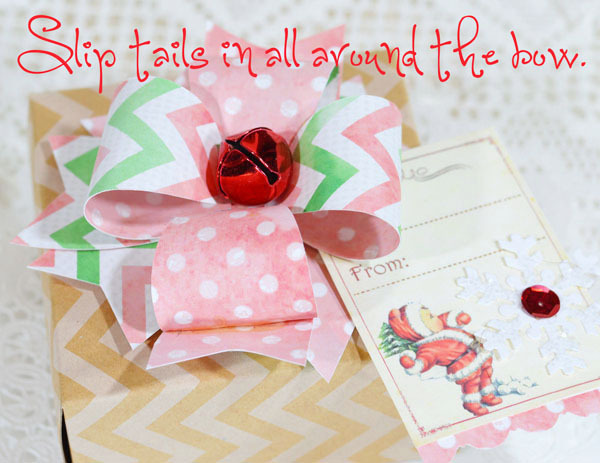 If you need a super easy cute favor for a party or perhaps a little something to give to co-workers, this might just fit the bill. 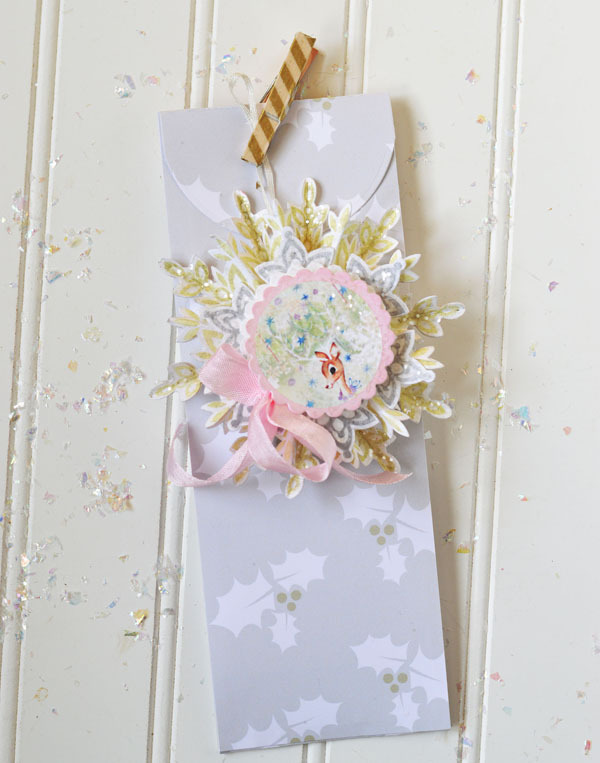 This cutie pie is from Kitty Bee Design. Oh, you will find cuteness there! 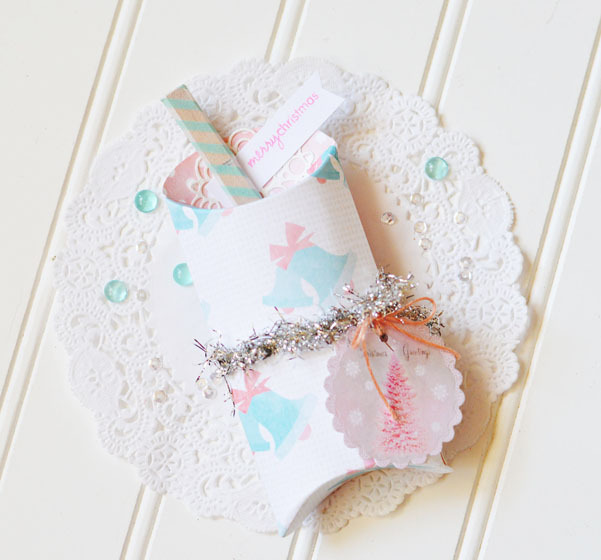 A big thank you to Kitty Bee Design for offering a giveaway every day this week! Do you like Peppermint Patties? Well that's what is lurking behind the snowflake band. I actually love Peppermint Patties, but hardly ever have one. I may have to have a treat. MAY have to? Let's change that to HAVE to! 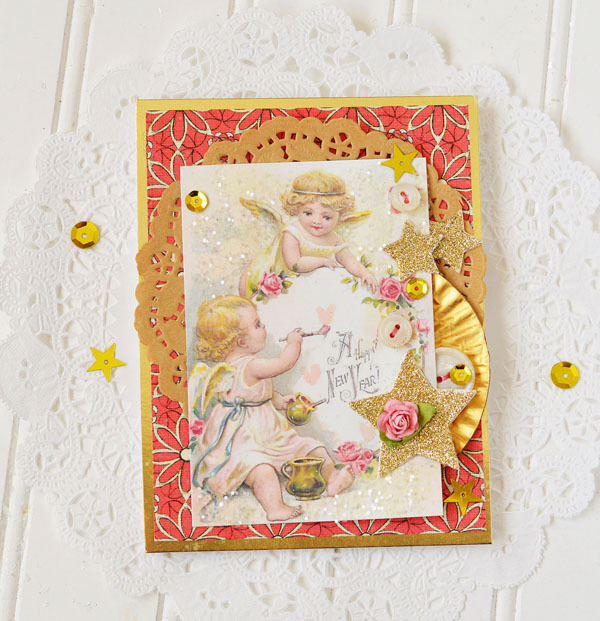 Studio Shine Vintage has awesome sweet cute vintage images! I think I need every single image she has! Aren't the gingerbread man and snowman adorable? If you want to see how to make the fringed straws, click HERE. The cute straws can be easily removed from the bag and could be used again. 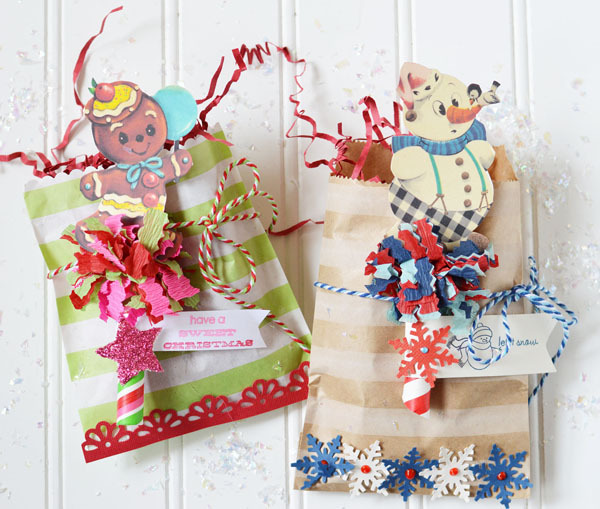 I also used the gingerbread man to make this really cool gift bag from towel fabric. At my local fabric store, they had a lot of different towel fabrics in bin. I didn't know what they were for until she asked me if I was going to be making towels. And then I thought "DUH!" I told her, I wasn't sure what I was going to do, I just liked the fabric! The end is already finished, so I just cut some off and sewed up the sides. I stamped some hearts and cherries and tied the top of the bag with red ribbon. Easy as can be and unique, too! 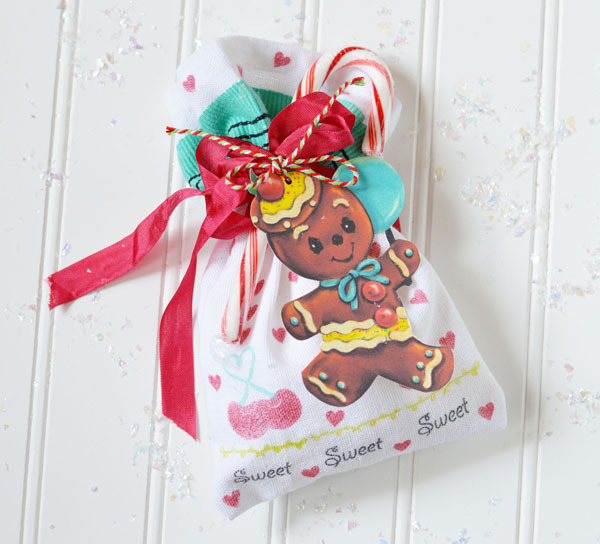 Of course, the gingerbread boy makes it super cute! Just a note: Cameo Shoppe is digital graphics. She is not associated with a Silhouette Cameo electronic cutter! Please excuse this picture - it was already super dark when I got home and I had forgotten to take it earlier. The black things are chalkboard coasters. Only one day left of Visions of Sugarplums! Welcome back! We're right in the middle of a fun week of Christmas! 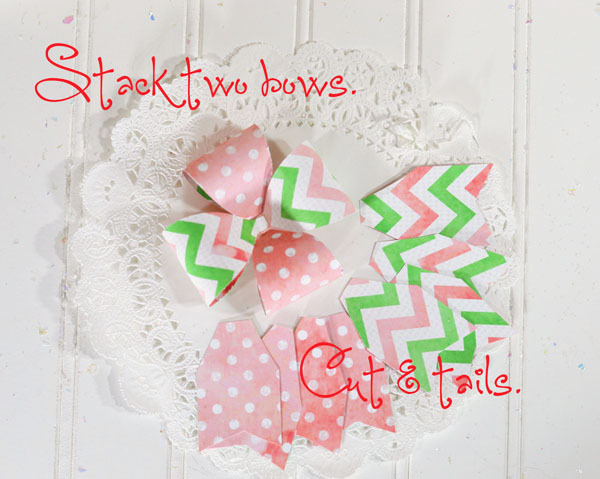 Today I've got a couple of projects featuring graphics from Cameo Shoppe. 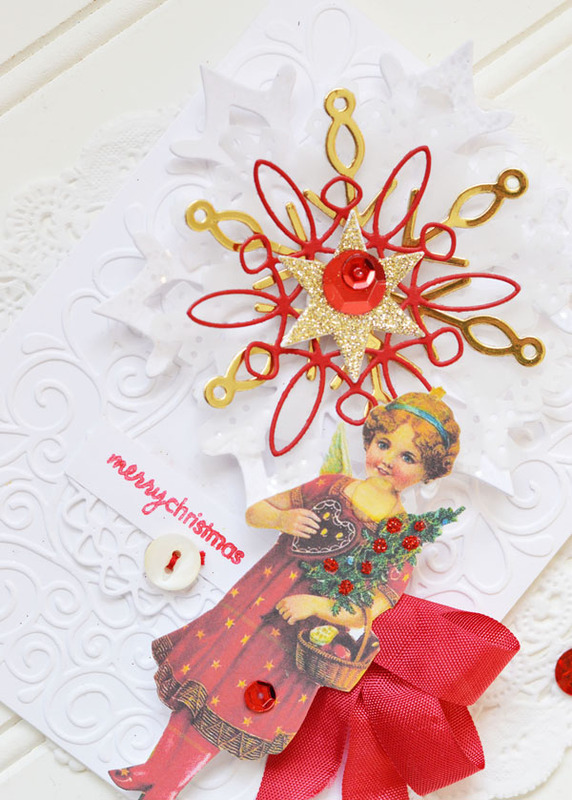 Cristina is one of the sponsors of Visions of Sugarplums and is generously offering a giveaway every day! First up is a pillow box that I made with a Pillow Box Punch Board. (I've put one of these in the Mega GiveAway.) It is a pretty cool tool! You can see one of Cameo Shoppe's circle images there. Isn't the pink tree pretty? 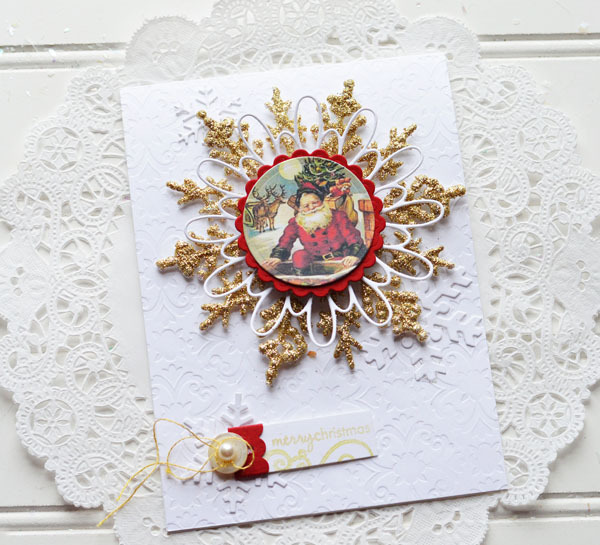 It's a part of the Christmas Circle Tags set. I guess I'm not tired yet of the gusseted bags. This one is a fun size! 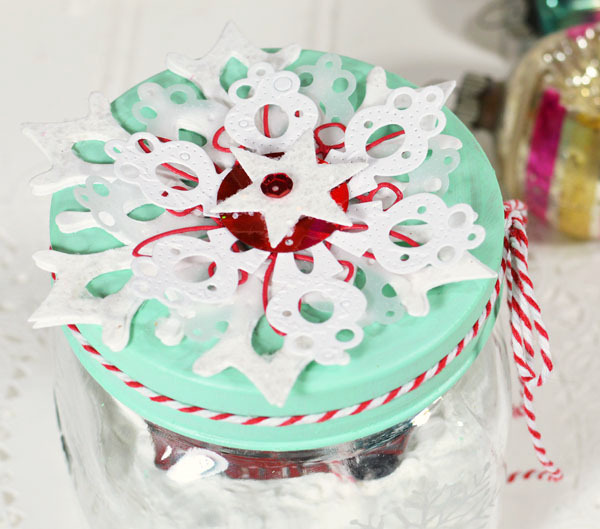 I used a couple more of the pretty circle tags to create snowflakes. I think these images are just adorable! 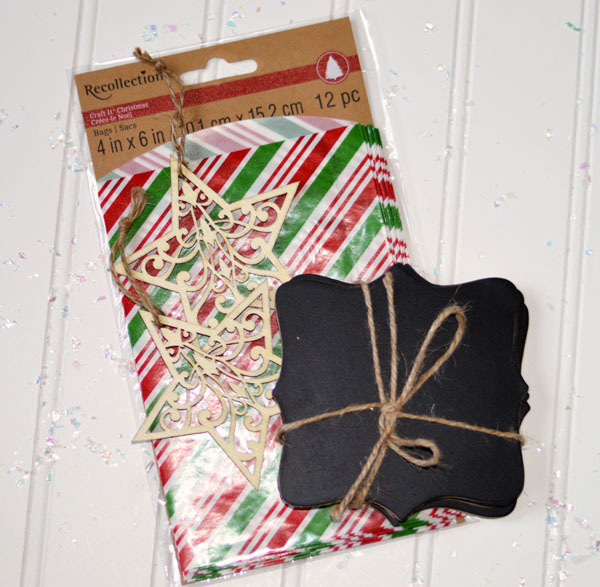 If you want to know how to make the 3D snowflakes, you can see them HERE. You need two sheets of printed paper. Cut one panel to 6" x 10 3/4". Score at 1/2", 1", and 1 1/2". Also score at 4 1/2", 5", and 5 1/2". Turn it and score at 1/2" and 8 3/4". 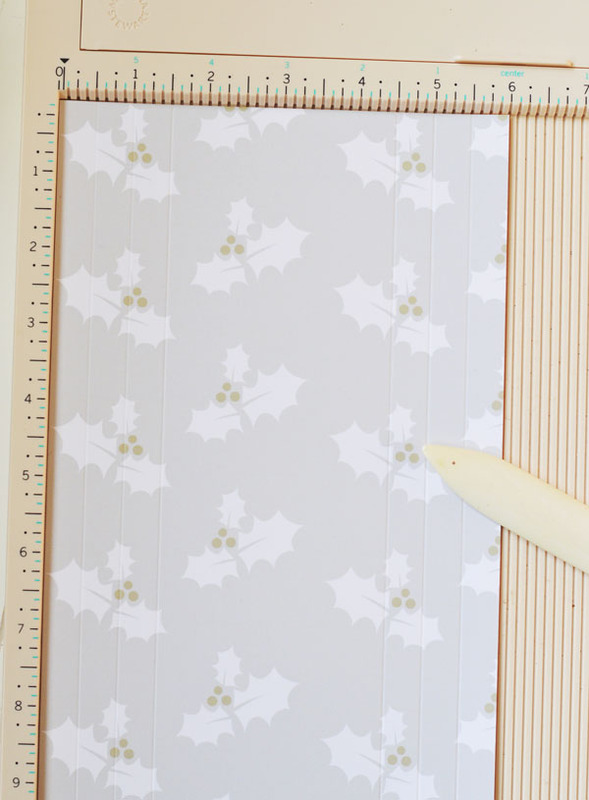 Cut away the top corners on the 8 3/4" score line and on the 1/2" score line from above. To make the rounded flap. use a circle die. When you run it through your die cutting machine, don't run it all the way through. Stop at the 8 3/4" score line - otherwise you'll just have cut a big circle out! Fold the gussets (instructions HERE). 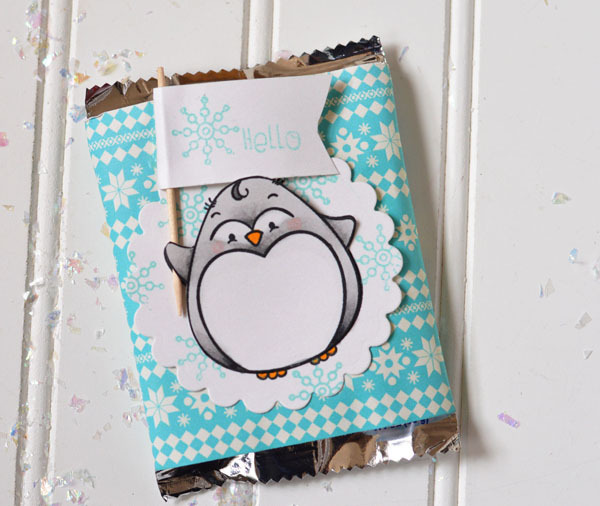 Fold up the bottom 1/2". Cut a second panel to 3" x 8 3/4". 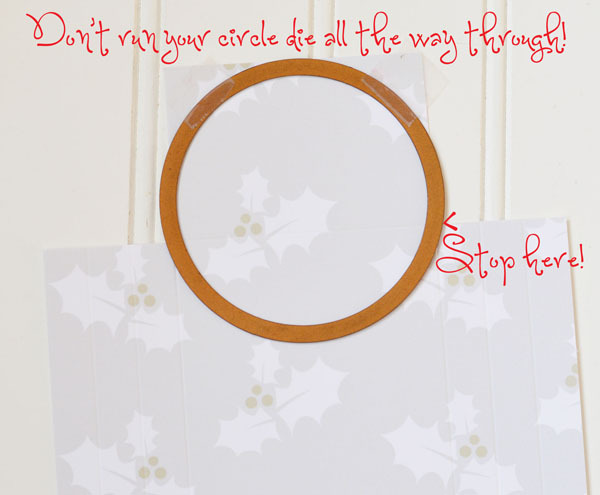 Die cut a half circle into the top. And glue it to the gusseted panel. Fold the flap over and you're done! These are a few of my favorite shops! Thank you so much to all of them! Go say "Hi!" to all these lovely ladies and enjoy their Christmas projects!